We provide members a fun, convenient, comfortable and motivating environment. The Curves workout takes just 30 minutes and includes all five components of a complete exercise program (warm-up, cardiovascular, strength-training, cool down and stretching). There are no gimmicks or "something for nothing" claims. It's the toughest 30 minutes in your day, but it works. 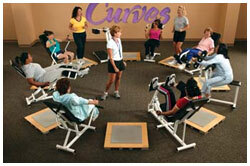 Curves Oak Bay - join us for some fast, fun, fitness! recognized by Curves International as an elite club. optimal experience for our members.